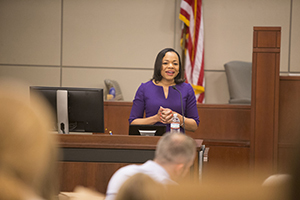 In the 2018 George Barrett Social Justice Lecture at Vanderbilt Law School on April 5, Kristen Clarke challenged VLS students to use their legal skills to address a “national assault” on civil rights that has included voter suppression, mass incarceration and police brutality. Clarke, president and executive director of the National Lawyers’ Committee for Civil Rights Under Law, began her talk by recalling a meeting convened in June 1963 by President John F. Kennedy, who invited attorneys from throughout the U.S. to Washington and challenged them to fight for civil rights in their hometowns and states. The late George Barrett ’57, for whom Vanderbilt’s George Barrett Social Justice Program is named, was one of 244 attorneys who attended the meeting. Barrett responded to Kennedy’s charge with a 50-year legacy of civil rights work, including Geier v. Tennessee, a landmark case that desegregated Tennessee’s institutions of higher education. Kennedy’s meeting sparked the formation of the Lawyers’ Committee, which Clarke now heads, supported by a network of more than 150 law firms, an additional 150 legal advocacy organizations and a board of more than 200 attorneys in private practice. In the 55 years since, according to Clarke, civil rights activists and organizations have brought about many positive changes. But she expressed concern that efforts by the U.S. Department of Justice to enforce the civil rights of all Americans, including actions to combat police misconduct, voter suppression, and discrimination based on race and sexual orientation, have “come to a virtual grinding halt” over the past year. Clarke expressed particular concern about voting rights in the wake of the 2013 U.S. Supreme Court decision in Shelby County v. Holder, which halted implementation of the portion of the Voting Rights Act of 1965 that had required states with a troubled history of suppressing voting rights to obtain preclearance via a federal review process before altering voting practices by redistricting or making changes in poll locations, voter registration and voter-identification requirements. “We’ve seen voter suppression rear its head at a fast and furious pace” since that preclearance process was suspended, Clarke said, citing the Lawyers’ Committee’s challenges to post-Shelby County voting restrictions enacted in Texas and North Carolina. Clarke was introduced by Professor Terry Maroney, who co-directs the George Barrett Social Justice Program. Maroney began by noting the historical significance of hosting the Barrett Lecture during the week in which the nation commemorated the fiftieth anniversary of the assassination of the Rev. Dr. Martin Luther King Jr., and by thanking Darren Robbins ‘93 for the generous endowment supporting the lecture. George Barrett’s daughter Mary Barrett Brewer ’86, Judge Martha Craig Daughtrey ’68 (BA’64) of the U.S. Court of Appeals for the Sixth Circuit, and Sally Levine, a long-time friend of the late George Barrett, attended the lecture as guests of honor.